In a previous post, I showed an ugly form. Ugly, because it looked awful when I ran the form with the Windows High Contrast Theme. So now I have a form that is unreadable in High Contrast. 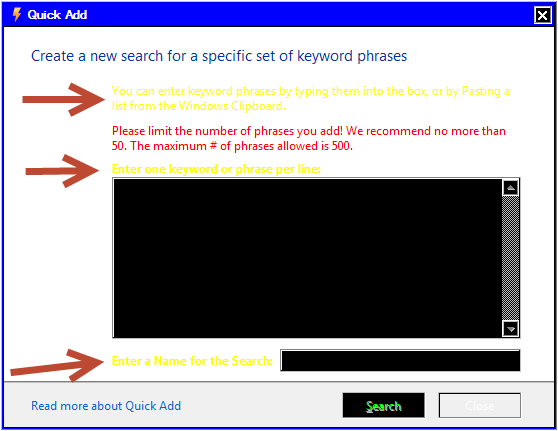 What I want to do is force Windows to draw the text black (since it is drawn over the white background). There's An Easy Fix For That! This is simple to do. 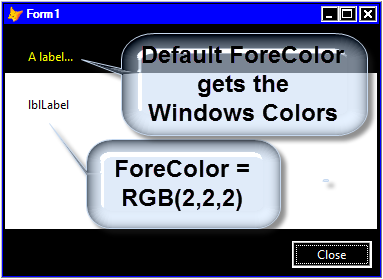 I set the ForeColor of the labels that I want to appear as black to RGB(2,2,2). 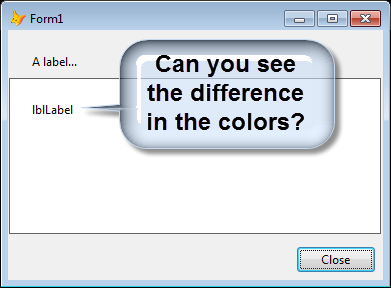 This color change from RGB(0,0,0) is imperceptible to the human eye (it still looks black), but Windows sees it as an absolute color. And since I have changed it to something other than the default, Windows will display the label in my near-black color (since it is not the Default). After my session at Southwest Fox, a couple of people said they do the same thing I do to force a label to be black, but they use RGB(1,1,1). Not sure why I picked 2,2,2 – but they're both black to the naked eye, and either setting works fine. Later in the series, we'll look at creating sub-classes for different controls. This one I'll call the lblForceBlack control, subclassed from a base Label class.